With the help of $46.7 million from the commonwealth, the Virginia Tech Carilion Research Institute plans to double its facility in Roanoke. The new 105,000-square-foot building would employ another 275 to 300 workers, expanding the institute’s work in its research specialties, such as neuroscience, heart disease, infectious diseases, and breast and brain cancer diagnostics and therapeutics. Funding for the new building is part of a $2.2 billion bond package passed by the General Assembly designed to make strategic investments in the state’s infrastructure and promising research at Virginia’s higher-education institutions. The bond package — combined with new and expanded research and development tax credits, economic development programs and workforce credential incentives — was a highlight in a session packed with more business-related legislation than any in recent memory. During a normal session, the chamber typically tracks 400 bills and takes positions on 40 to 50. This year, the chamber tracked 620 bills and took positions on 125. This year’s legislation could create a new era in research at Virginia’s universities. Through additional money and incentives, legislation this year put a major focus on the commercialization of university research. Under the budget that begins July 1, a current program, The Catalyst, will receive a major funding boost in its efforts to incentivize universities to collaborate with each other and work with industry partners to commercialize biosciences research. Previously, the program, officially named the Virginia Biosciences Health Research Corp., had about $2.5 million to spend each year. In the budget starting in July, it will receive a total of $10 million over the next two years, including $2.5 million specifically dedicated to health research with commercialization potential.“Great research is being funded, but it has a real impact on growing commercial opportunities,” says Gallagher. A new initiative is designed to advance university research in all technologies. This year, the General Assembly created the Virginia Research Investment Fund (V-RIF). The fund, which will include $28 million in general funds during the next two years and $29 million available from the bond package, will have two major objectives. 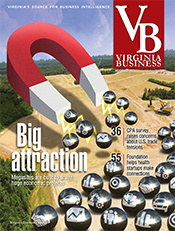 The first goal is to help Virginia’s universities attract top-notch researchers with track records in commercialization. V-RIF’s second goal is to fund the creation of centers of excellence focused on a specific area of research, such as diabetes or neuroscience. This fund will encourage universities to create partnerships with the private sector in various industries. Increasingly, research-funding organizations are interested in backing collaborative projects rather than research that is specific to one university. “It’s a way to bring expertise together and become best in class by collaborating,” says Gallagher. 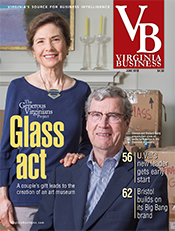 The fund was based partly on the Georgia Research Alliance, which Virginia Bio persuaded Gov. Terry McAuliffe to visit on a fact-finding mission last fall. The bond package also includes major investments to promote economic growth. 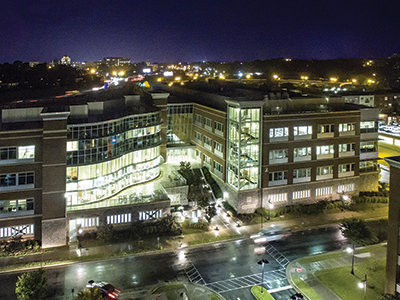 In addition to doubling the Virginia Tech Carilion Research Institute, the bond issue includes money for the expansion of Virginia Commonwealth University’s School of Engineering and construction of a new STEM laboratory building on campus. It also supports the creation of the University of Virginia Center for Human Therapeutics, a research center focused on using medical research to create commercial drugs. Inova Health System also is a major beneficiary under the bond issue as it develops its Center for Personalized Health campus in Northern Virginia. The campus is focused on developing research around personalized medicine, which aims to predict, prevent and treat disease based on a person’s genetic makeup. The bond package includes $20 million for research at the Global Genomics and Bioinformatics Research Institute at the Center for Personalized Health. The money would fund lab renovations for research projects with the institute that involved at least two of Virginia’s higher education institutions or one higher education institution and one private-sector company. Legislators also agreed to expand an existing research and development tax credit for small businesses and add a new tax credit aimed at attracting larger research and development companies. The current research and development tax credit was capped at $5 million, but demand had exceeded that the past few years. This year’s legislation will increase the cap to $7 million a year. The legislation also increased the cap for each company to $45,000. That cap rises to $60,000 if research is done in conjunction with a Virginia university. Other legislation passed this year will put a new emphasis on developing exporting opportunities for Virginia companies. 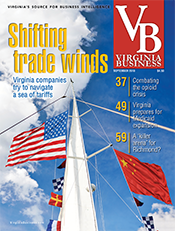 The Virginia Chamber of Commerce, along with the Virginia Maritime Association and the Virginia Manufacturers Association, led an initiative to establish the Virginia International Trade Corporation (VITC). That new organization will pull international trade activities from the Virginia Economic Development Partnership. VITC will be designed to help companies take advantage of existing trade programs at the federal, state, regional and local level. 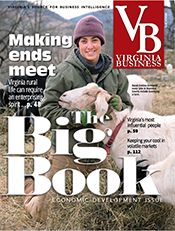 A first-of-its kind study funded by the chamber showed that from 2009 until 2014, 30 percent of Virginia’s economic growth came from increased exports. The separate agency would allow more Virginia businesses to take advantage of Virginia’s popular exporting-assistance programs, says DuVal. 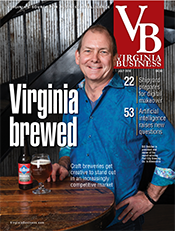 “One of the ways we can help Virginia’s existing businesses is by aligning the trade activities of the commonwealth and therefore making it easier to access affordable costs and higher-quality trade programs that will help Virginia businesses expand their export products,” he says. The VITC will be organized during the fiscal year starting July 1, and its powers and duties become effective April 1 next year. 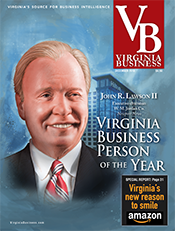 The chamber also backed another major economic development initiative passed this year — GO Virginia — although the program will require further legislative action next year. 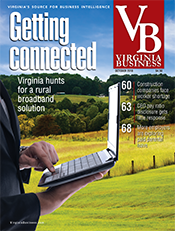 In the budget, GO Virginia received $36 million for grants encouraging collaboration among businesses, school systems and governments in each region. 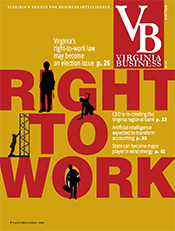 The legislation established the Virginia Growth and Opportunity Board to administer the program and regional councils that would apply for grants. 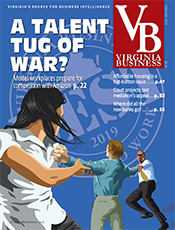 The legislation, however, was almost held up by disagreements between the governor and the legislature over control of the GO Virginia board and the power to approve exceptions to the bill. The legislation includes a hardship provision for smaller localities that could not meet minimum project standards — an investment of $25 million and the creation of 200 jobs. In the end, a compromise was reached, which allows the board and regional councils to be set up, but regional grant funding won’t take place until the second year of the budget. A working group will study the issue, and the legislature must revisit the legislation next year. “We think the agreement was a constructive step forward, and we are pleased at the bipartisan nature of the agreement,” says DuVal. Not every industry benefited from the 2016 General Assembly. McAuliffe vetoed a bill that would have extended tax credits for Virginia’s coal industry. 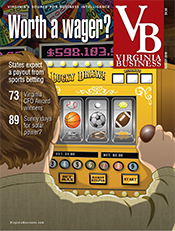 The governor pointed out that the credits have cost Virginia $610 million since 1988. During the same period, the number of Virginia coal mine jobs fell from 11,106 to 2,946. The coal industry in Virginia has been suffering from increased regulation and competition from natural gas. Details on many of the new programs established this year will be cemented during the next couple of years. Many issues punted this year could become major issues next year. Certificate of Public Need (COPN): A number of bills were introduced this year that would have dismantled or changed Virginia’s COPN regulations. The Senate carried over legislation that would have removed imaging services, such as MRIs and CT scans, from the state’s COPN regulations. Hospitals have argued these services help pay for their charity care and emergency-room services, while proponents say this change could help to lower health-care costs. Airbnb: Legislation that would protect Virginians’ ability to rent lodging through Airbnb and create a process to collect taxes was approved with a re-enactment clause. That legislation requires the General Assembly to approve the legislation again next year and instructs the Virginia Housing Commission to study the issue. Angel investor tax credit: This credit, provided to investors in companies, has been over-subscribed. In fiscal year 2014, investors submitted applications for $9 million in tax credits, although the credit is capped at $5 million. Legislation introduced this year would have increased the limit to $9 million. Another bill would have eliminated the credit altogether. Both bills were defeated, but the legislature plans to study the issue during the next year. The Port of Virginia will receive $350 million — the biggest piece of the bond package — to increase capacity of its largest terminal. The project will allow the terminal to stack containers higher and more closely together. The larger terminal will help the port respond to growing cargo traffic and the increased usage of large container ships. The New Economy Workforce Credential Grant Fund and Program (SB 576/HB 66): The program, administered by the State Council of Higher Education for Virginia, will allow higher education institutions to provide grants of up to $3,000 to Virginia students for completing noncredit workforce training programs. New tolling legislation (HB 1069) prevents an administration from adding tolls to existing highways, bridges and tunnels without General Assembly approval. The restriction would not apply to new construction or to HOV and HOT lanes. The extension of a data center tax credit (HB872/SB64) until 2035. The tax credit was scheduled to sunset in 2020. 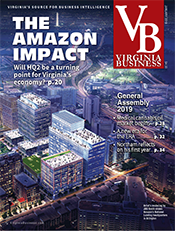 “We’re at the point where more than half of the states offer a sales tax exemption, so the competitiveness has really ramped up,” says Josh Levi of the Northern Virginia Technology Council. Passage of a law (HB412) that prohibits localities from regulating unmanned aerial vehicles/systems (drones) for three years while the state conducts its own study of the technology. The addition of computer science and computational thinking, including coding, (HB831) to the Virginia Standards of Learning (SOLs). The Virginia Board of Education will determine how to add these into schools’ curriculum.